This class is for our first time babies and tots. We work on introduction into the water and basic skills with a parent in the water. We work on submersions, buoyancy, introduce back floating and over all water orientation in a structured class with songs and toys to help introduce skills. 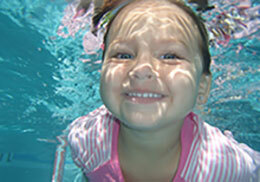 This class is for our babies and tots that have already been introduced to swimming lessons. This class works on increased independence in the water and back floating, rollovers, increased distance and continued enjoyment in the pool. Parents are in the water.